What elements constitute a legendary home library? A few books? A handful of bookshelves? Some unique architectural elements that most folks can only dream of? Some home setups have all of the above, and then some. 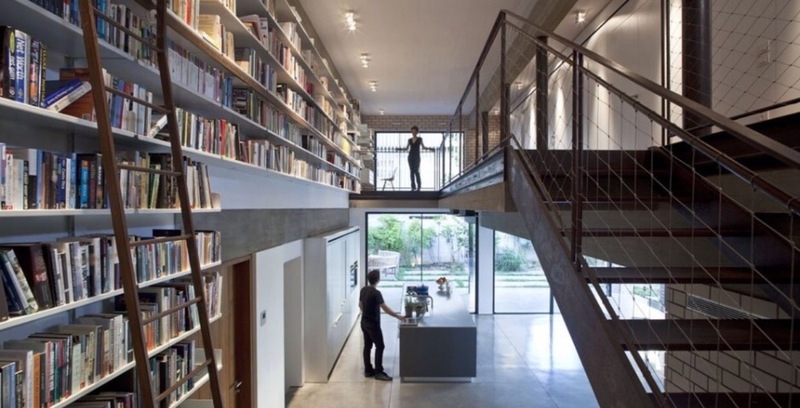 This week’s pick is that sort; a truly immense space, stacked to the rafters full of books, a space reminiscent of a true library rather than one tucked away in a home. One would definitely have to up one’s book acquisition game in order to fill the gang of space on those shelves! Let the daydreams commence. Love this concept! Can’t wait to follow your blog. Thank you so much, and thanks for your support! It’s a pretty grand space there, right? It almost looks like some sort of facility rather than an actual home library. There’s an industrial feel there (I dig it). The rows and rows of paper gold are certainly the cherry on top. Reading material for 17 lifetimes! Thanks for checking out the post🙂.